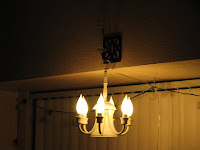 This old lamp 80's style has been reborn. 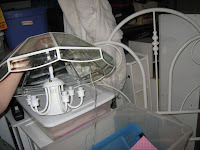 It came back to life as a chandelier and a cloche (French for mini green house). I rewired the thing and added flame light-bulbs. 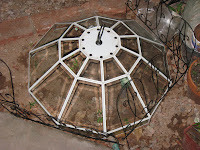 I also added a handle to the cloche for ease of checking the delicate plants below. The glass makes a great insulator. The original lamp was a $10 find. You are so inventive. Love it!